This article will instruct you how to download, login, and configure the VirtualShield extension for your Mozilla Firefox browser. This tutorial works with Firefox on both macOS, Windows, and Linux computers. There is also an animation at the end of this article demonstrating this installation process. Open Firefox. If you don't have it installed, you'll need to download install it from the main Firefox website (click here). IMPORTANT: Make sure you open this link inside of Firefox. If you are not in Firefox right now, copy and paste the link into your Firefox browser. Firefox may prompt you asking for permission to add the extension. Click the "Allow" button. Firefox will now ask you to confirm the installation. Click the "Add" button. 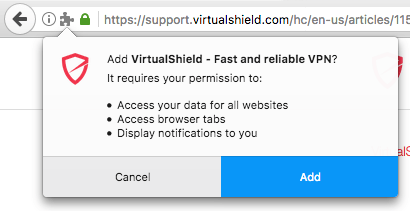 The VirtualShield extension has now been installed in your browser! You can access it anytime using the VirtualShield icon that will now show up on the right-hand side of your address bar inside Firefox (see below). Note: This animation starts from after you click the extension installation link above.